Gary David at the Sedona 2009 Ancient Mysteries Conference explores the mysterious location of Pueblos in the American Southwest, circa 1100 AD, that appear to be a mirror image of the major stars of the Orion constellation. A fast-paced, visual look at such topics as The Sky Over the Hopi Villages; Orion Rising in the Dark Crystal; The Cosmo-Magical Cities of the Anasazi; Windows Onto the Cosmos; To Calibrate the March of Time; They Came from Across the Ocean—The Patki (Water) Clan and the Snake Clan of the Hopi; Ancient and Mysterious Monuments; Beyond That Fiery Day; plus tons more. All our DVDs are Valid in All Regions and All Countries! 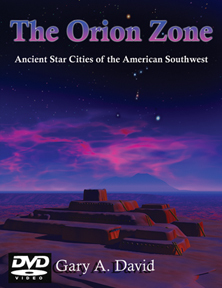 THE ORION ZONE DVD With Gary A. David. 75 Minutes. DVD in Box. Extras.